Check out these Historic Sites & Buildings in the towns of the Wheatbelt region of Western Australia (WA) and learn about the history, heritage and culture of the region. Bates Street Merredin. Constructed of bricks salvaged from several old Coolgardie Hotels and with stage, fly tower, and pressed metal ceiling from the Tivoli Theatre in Coolgardie, Cummins Theatre opened in Merredin on the 11th of October 1928. Brewer James Cummins had the theatre built. 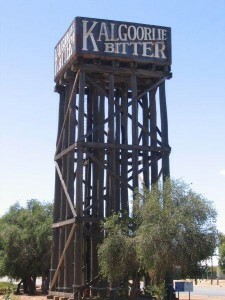 He and later, his daughter Alice, operated a brewery in Merredin until the 1940’s. Their graves can be seen at the Pioneer Cemetery. 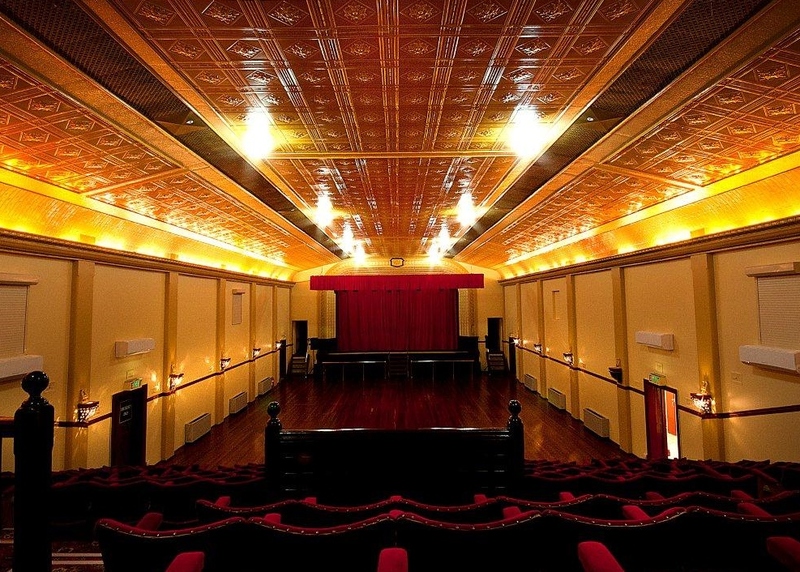 The Theatre archives boast one of the best collections of Australian performers in the State. On the register of heritage places. Situated along the Great Eastern Highway in Merredin. Pioneer Park contains the Railway Water Tower, a 50 foot high tower built in 1893. The water from the railway dam was pumped to the tower where it was used by steam locomotives until the 1960’s. The park is also a good place to have lunch over looking the Bronze Horse, Man, Dog and Plough a statue commemorating early farming ways. The Water Tower is on the Register of Heritage Places. Located off Benson Road in the Merredin Townsite. Constructed in 1893 as part of an imaginative engineering feat to harvest water from the rock outcrop that is Merredin Peak. The rock channel connecting the Peak to the dam uses local material and is a very good example of this technique. 45,000 cubic metres of run off is channelled into the dam annually and is still used to water parks and gardens in the town. Three kilometres west of Merredin along the Great Eastern Highway. No4 Pump was designed by C.Y. O’Connor and built in 1902 as one of 8 stations used to pump water from Mundaring to the Goldfields. The station was closed in 1960. It was replaced by the electrically driven stations located nearby. Interpretation on site. Merredin was a base for the RAAF during World War 2. Military sites include a field hospital, fuel dumps, supply hangars, radar sites and ordance igloos. Mangowine is a fascinating pioneer homestead located on the Karomin North Road 14kms north of Nungarin. The property was originally built for Charles and Jane Adams in 1876. 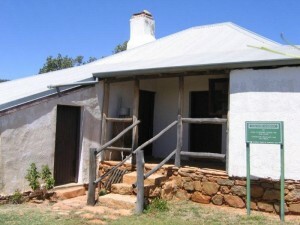 The homestead is constructed of stone and mud brick, and includes: wayside inn, cellar, wells, and a family grave. Rooms contain items from the era as well as photos, and maps relating to the Adams Family. Open: Weekdays and Saturdays – 1pm to 4pm Sunday 10am to 12.00pm and 1pm to 4pm Phone: +61 8 9046 5149. Located on the Main Street of Shackleton this 3m x 4m weather board building was used as a bank agency until 1997. Built in Bruce Rock as an Infant Health centre and shifted to Shackleton in the 1930’s for the Agricultural Bank. No6 Pumping Station, is one of a series of eight steam pumping stations used to carry water to Kalgoorlie via the Goldfields Pipeline. Located on Wolfram St Westonia. In 1916 Reverend Joseph Budge originally built a Church Hall as a meeting place at Naretha, a 205 mile camp along the Trans Australian Railway. When the Camp was disbanded in 1918 the church was dismantled and railed to Kalgoorlie. At the request from the Bishop of Kalgoorlie the church was re-erected at Westonia in October 1918. The architectral style of the building is typical of gold rush days with the use of weather board and iron. The interior of the church has a double raised roof with ecclesiastical heads. The alter area recesses back from the main area with a carved wooden alter and a vestry at the back of the church. The exterior is of jarrah cladding with Gothic style windows. The entry is covered by a portico with double wooden doors. The Bell Tower was constucted in 1970.